With the magic of Google (thank you, Google maps), I was able to locate the exact tree under which I sliced the soft skin of my foot, of which I still bear the scar. I was six years old when I was stood on a broken piece of glass, and all I saw and felt was never-ending blood. 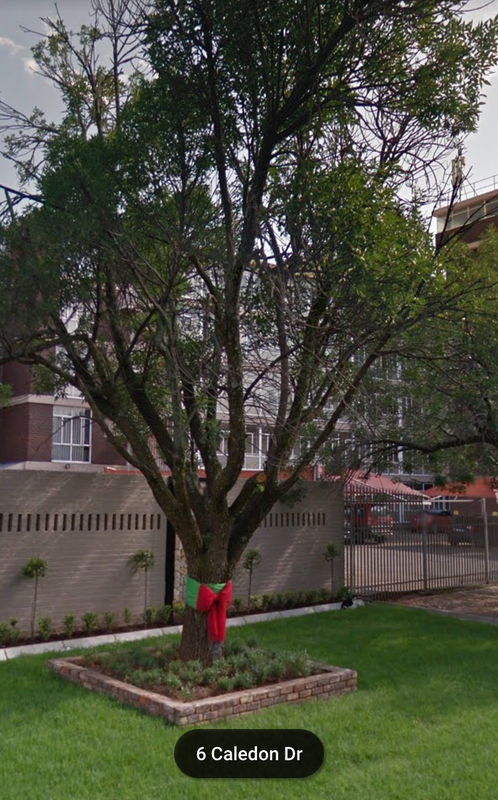 I love that the tree is so well maintained, and clearly loved with that bright red ribbon. If I close my eyes and travel back, I smell banana yoghurt as well as choc chip, I remember ballet lessons, being left out of my 8 year birthday party (all my friends wanting to play with my sister), a red bicycle, and a broken collarbone. I remember wooden floors and happy times. Sitting in the backseat of the car holding a tea towel over my bleeding foot, all the while it was getting soaked. And the Friday after my birthday we left school early, moved from my home town, away from my best friend (who for some reason must have not been at my party), and to the big lights of the city (Johannesburg). Away from the beautiful tree, and the best school ever. Jenny, David, Angie. You must have missed it so much!